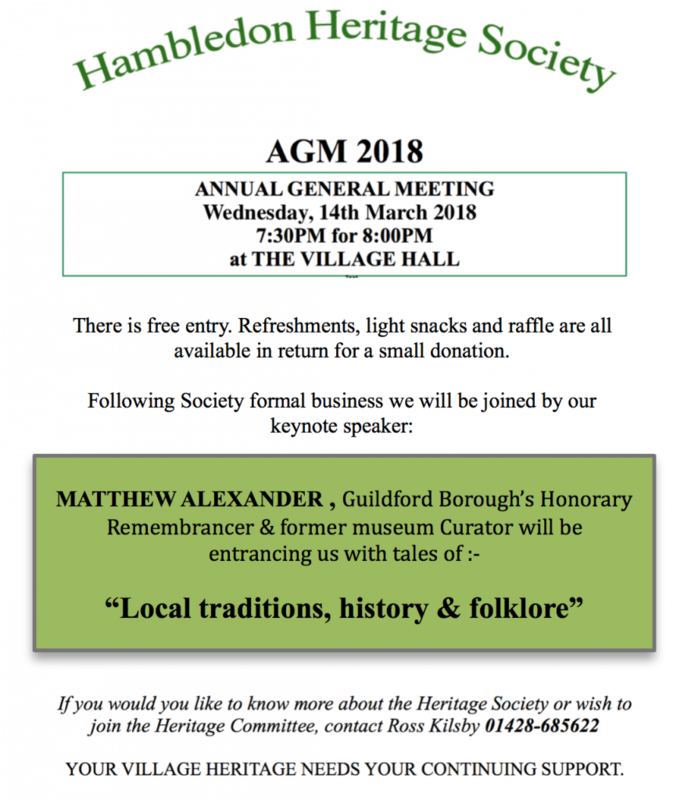 The Hambledon Heritage Society was established to ensure OUR VILLAGE heritage is understood, documented and appreciated by current and future generations. Many village residents have supported the aims of the Society, with important contributions such as the compilation of the village scrapbook, publication of booklets and articles plus of course the popular speaker’s presentations at the Annual General Meeting, with topics ranging from dendrochronology, WWll memories through to famous residents and associated village houses. 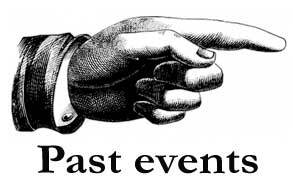 The Society continues with its programme of research activities but is now wishing to encourage, new, interested Researchers to add to this programme, by offering two, Heritage Research Bursaries of £100.00 each for 2017-2018. These Bursaries are designed primarily to attract young Researchers, who are in full or part time education, are normally Hambledon residents or progeny of current residents and are interested in conducting village heritage research, selecting a topic of their choice. However, research has no age limitations. Examples of such topics could be; glass manufacturing, the workhouse, why a two-centred village?, the lime kiln and its uses etc. 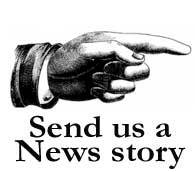 but new and innovative topics would be welcome. 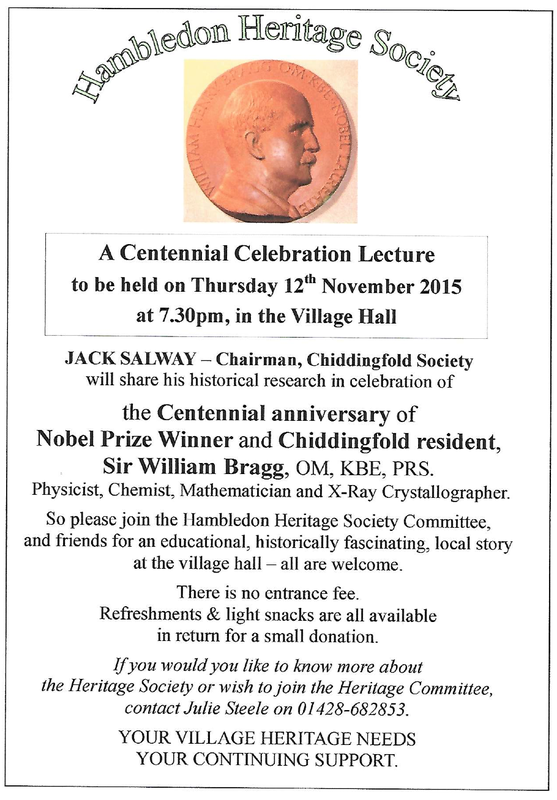 To apply for one of the research Bursaries or just to make an enquiry, please write to or call Stephen Maycock, a member of the Hambledon Heritage Society committee who will be pleased to discuss the Bursary programme in more detail. 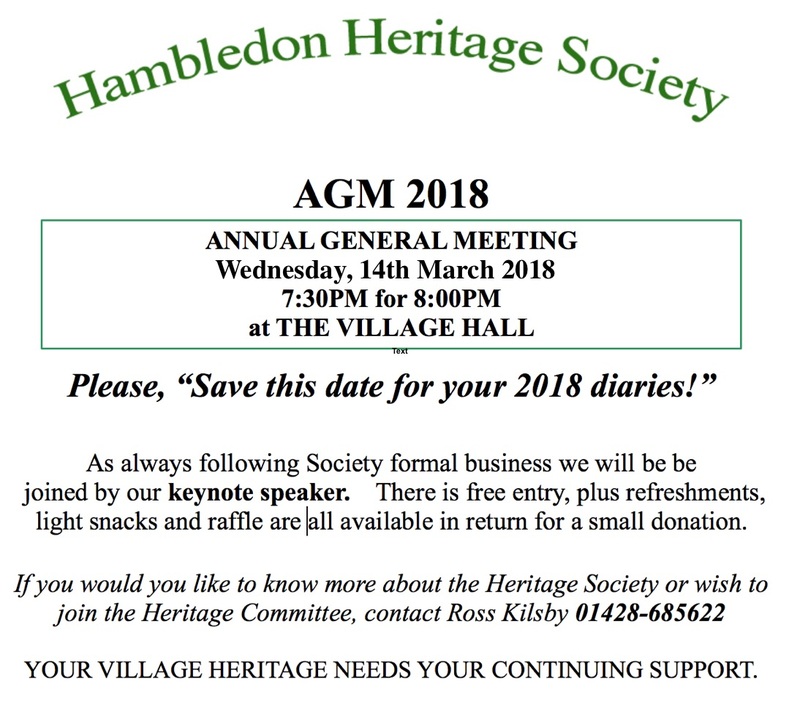 For further information regarding the Hambledon Heritage Society and its activities please contact, Ross Kilsby, Chairman, 01428-685622. The obelisk on the flank of Hydon’s Ball, which commemorates the lives of two brothers who died in the First World War, has been given a Grade II Listing as a structure of special interest by Historic England. The Listing gives protection to the monument and official recognition of its architectural and historic significance. It is one of more than 2,500 memorials to the fallen that Historic England is listing as the nation remembers the 100th anniversary of the 1914-18 Great War. More than 740,000 military personnel from the British Isles alone died in the deadly global conflict. The obelisk commemorates Second Lieutenant Laurance Robertson, aged 36, King’s Own Scottish Borderers, who was killed in action during the Battle of the Somme on 30 July 1916, and his brother Captain Norman Robertson, 40, of 2nd Battalion, Hampshire Regiment, who died in a military hospital in Hanover on 20 June 1917. 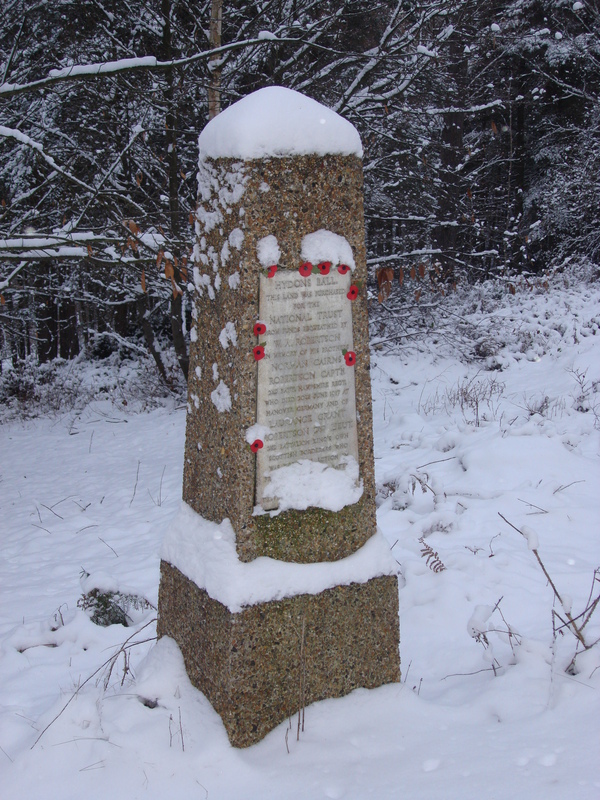 Our photograph below shows the obelisk following the heavy snowfall in November 2010, two weeks after Remembrance Sunday. It was erected as a result of a bequest to the National Trust in the will of their eldest brother William, who died in 1937. The Trust already owned much of Hydon’s Ball and the bequest required the purchase of a small plot of land on Hydon Heath and the erection of the monument. This was completed in 1959. The obelisk can be found beside the footpath below the summit on the south-west slope of the hill. It is easily reached from the lower end of Church Field, through the kissing gate, turning right to the little pumping station and then following the path up hill to the left. Many villagers leave poppies on the memorial around the time of Remembrance Sunday. 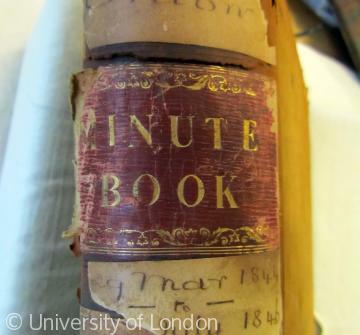 Volunteers at Surrey History Centre have recently completed indexing the Hambledon Poor Law Union minute books for the period 1836 to 1910. These minute books recorded each meeting of the Board of Guardians responsible for overseeing Hambledon Workhouse (now Hambledon Park). You can read more here about the Poor Law minute books and download the online index here. June 1st saw a significant event for the history of Milford Hospital. Two former patients returned to see a plague unveiled to mark their meeting in 1948. Ray Galton & Alan Simpson met as 19 year olds suffering from TB. They stayed for many years receiving treatment – but their time was well spent. The started to write comedy sketches together, which were performed on the rudimentary hospital radio service. They went on to become the foremost comedy scriptwriters – creating Hancock and Steptoe and Sons, and a huge catalogue of shows over the following decades. 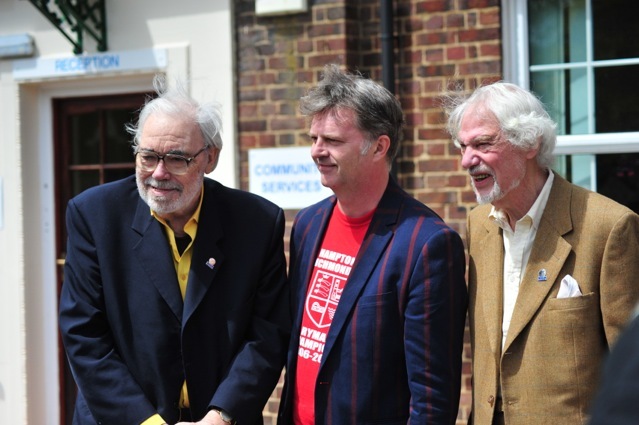 The plaque was unveiled by their friend and performer Paul Merton. I had the privilege to meet the guys a few years ago, as part of my research for the Milford Hospital History Website. 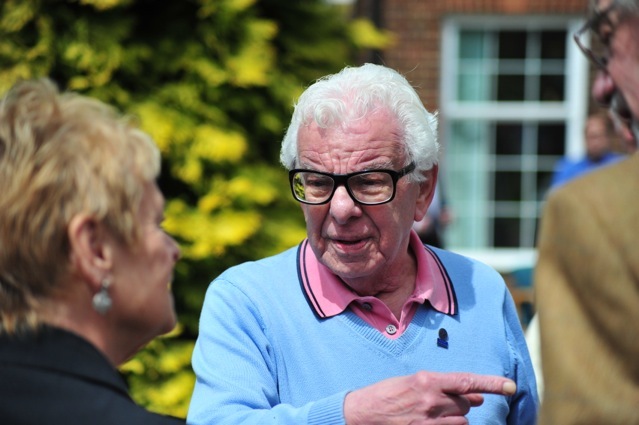 They described to me in detail their years at Milford, and most interestingly, the location of the original laundry cupboard in which they built their radio studio – arguably the “Birthplace of the British Sit-Com. Wednesday’s AGM was a well attended affair, not least because of the guest speaker’s excellent presentation. 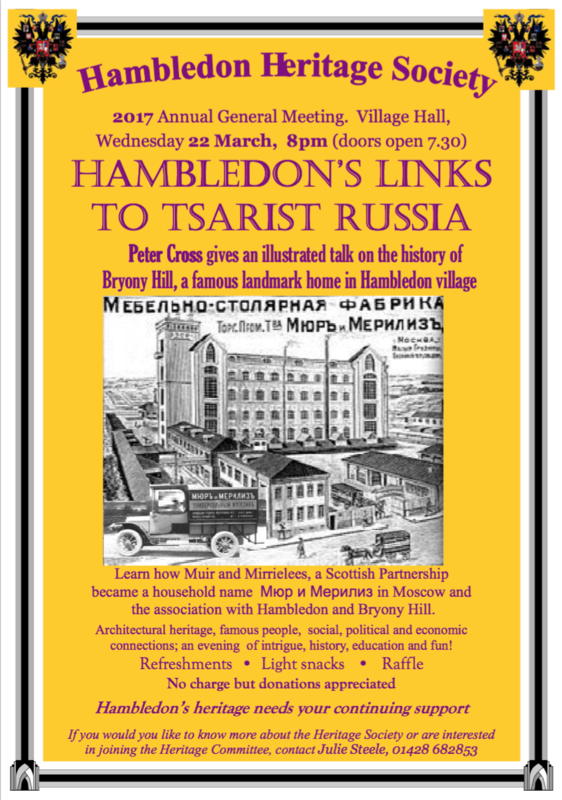 Norman Gravestock gave an entertaining talk on the heritage of Hambledon. Listen to his whole speech here. At the start of the year Surrey History Centre chose our website as one of three Surrey websites to be part of a new archiving project in association with the National Archives. I am pleased to say that the project is now completed. 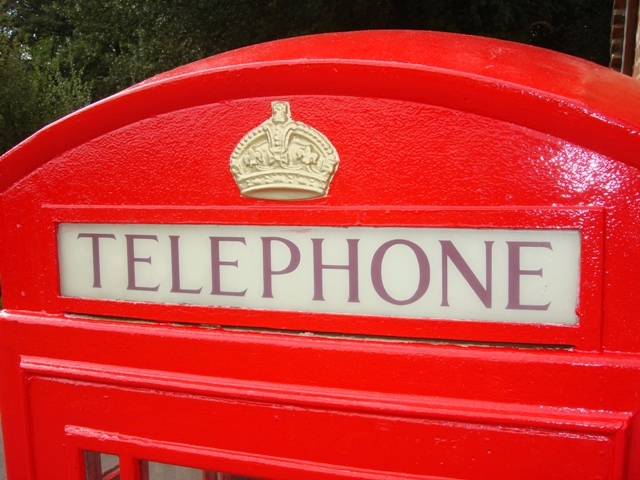 This is a super feather in the cap for Hambledon. A page on their website gives further details and also includes a link to the archived version of the Hambledon Village site. More information is also available on the National Archives website. 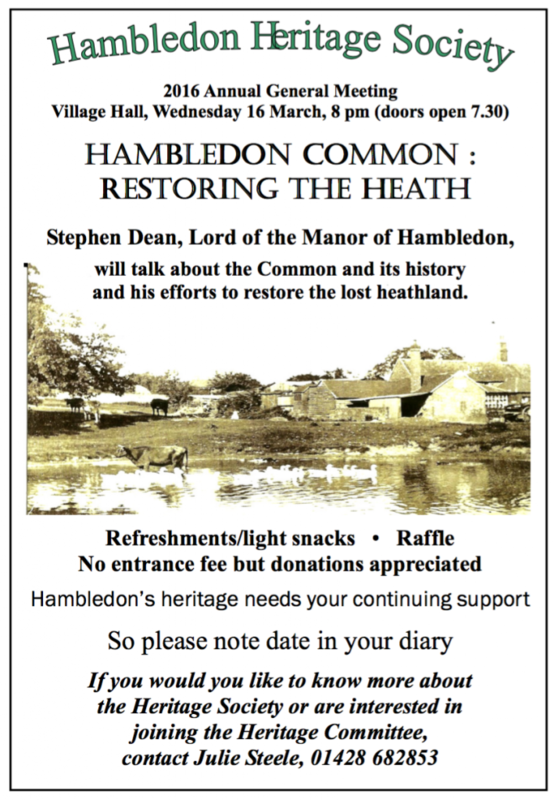 The Hambledon Heritage Society is developing a series of guided walks encouraging the exploration and understanding of Hambledon and its historic landscapes. The first in this series will follow the footpaths and bridleways through part of the Hurst. This guided walk will enable us to become aware of layers of geological and archaeological time and discover the history revealed in the landscape. 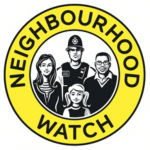 Join us on Sunday 26th June at 11:00am. 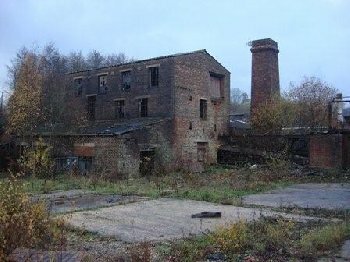 We will meet at the entrance to the disused Nutbourne brickworks. The walk will take circa 2.0 hours with pauses for observations, briefings & questions. 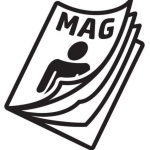 A small, minimum donation of £2.00 per adult is requested but children will be free as part of the Society’s philosophy of encouraging our younger villagers to better understand, enjoy and become enthusiastic about, OUR VILLAGE HERITAGE. 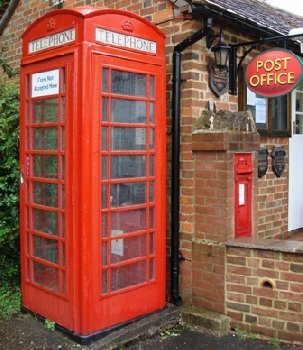 The Hambledon Heritage Society is proud to announce the publication of the first part of their Oral History Project: video and audio recordings of villagers’ stories recounting life in Hambledon during the 1940’s. Access via the History menu.